These Meal Planning and Meal Prepping Ideas are sponsored by Peapod. All opinions are 100% mine. We’ve found that meal planning with Peapod – as well as some ahead-of-time meal prepping – is a key strategy that helps make it a lot easier to get back to the routine. A meal plan is an outline of what you’ll be making for breakfast, lunch and dinner for the week ahead – so you can shop once for everything you’ll need to cook for the week ahead. It’s also a great way to ensure that your family eats delicious and healthy, home cooked meals instead of relying on take-out. Do your meal planning on a regular schedule. Pick a day for meal planning that works for your family and make it a regular part of your week. For us, weekends are slightly less hectic and when we do most of our cooking, so I develop our meal plan for the week ahead on Thursdays or Fridays. Look at your family’s schedule for the week ahead and plan your meals accordingly. For example, on Mondays we go right from school to piano lessons then to swim practice – with very little time in between. So – for Monday’s dinner, I know it will be a ‘reheat and eat’ meal that we cook ahead of time. Or, maybe you have plans to go out to dinner on Friday night with some friends – one less meal to plan! Cook once – eat twice. One of the biggest time savers is cooking once, then getting a second (or even a third) meal from the same recipe. As you plan your meals, think about preparing a few extra portions of a dish, and plan to pack the leftovers for lunch the next day. Or, use one pre-cooked ingredient in different recipes throughout the week (see our sample meal plan here for examples of this). Use time-saving tools when placing your order from Peapod. Save a shopping list of items you frequently purchase, then quickly add items to your Peapod order using Express Shop. Or, click on Past Purchases and quickly add items you’ve ordered in the past to your current order. Food Storage Supplies. 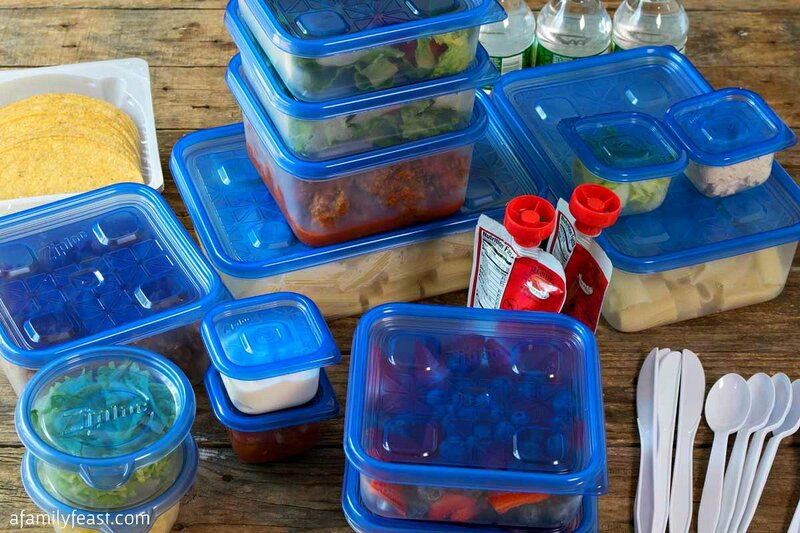 In addition to your groceries, add a variety of different-sized food storage containers and food storage bags to your Peapod order – you’ll need them as you start to do your meal prepping. Consider Meal Kits. Did you know that Peapod offers a variety of complete meal kits that are a delicious and quick option for preparing a meal for your family? Each kit includes pre-measured ingredients and a recipe with cooking instructions. Schedule a food prep day. Once your groceries have been delivered, set aside a few hours to prep and cook for the week ahead. Divide and portion out for multiple meals. Divide and pack up your ingredients based on what you’ll need for each recipe. Slice meats, wrap tightly and freeze for later in the week. Chop fruits and vegetables – then pack some up to bring for lunch, or to add to breakfast smoothies. Cook once for multiple meals. For example, roast a chicken for Sunday dinner – then make chicken salad with the leftovers for lunch the next day. Cook up a batch of ground beef – make tacos for dinner one night, then spaghetti and meat sauce another night. Bake a batch of muffins – eat them for breakfast throughout the week. You get the idea! Make it a family affair! There’s the saying: “Many hands make light work.” Ask your kids to help chop the fruit and vegetables. Have your spouse cook the side dishes while you prepare the main course. If everyone chips in with the food prep – you’ll get it done in a fraction of the time. Follow the meal plan. Eating is the easy part – simply follow your meal plan for the week! Visit FromThePod.com for many more tips and tricks, recipes and meal plans that will help you get back into the Back-To-School routine. See the Meal Plan we developed for Peapod by clicking here. And for information about Peapod grocery delivery services, visit Peapod.com. My daughter does this, especially for her lunches. She ordered Bento boxes off Amazon, and fills them for every day of the week. They have sections for different items, but offer a 1 piece lunch kit. They come in a pack of 15 with lids for $15, or a dollar each. Great to have. Great suggestion Pat! Sounds like a real timesaver!